I saw about 158 wing recipes in the weeks leading up to the Super Somewhat Okay Bowl, but I didn't try any of them. Nope, I stuck with our tried-and-true, making use of basic ingredients and a little-muss-little-fuss method. Heck, it's easier to clean up the dishes used in preparing these than it is to tidy up your person after consuming them! If you like wings and you like dead simple, give these flappers a try. Preheat your oven to 350 degrees F and line a sheet pan with aluminum foil. To set up your station, have one bowl containing the melted butter beside another bowl containing a mixture of the cheese and seasonings. 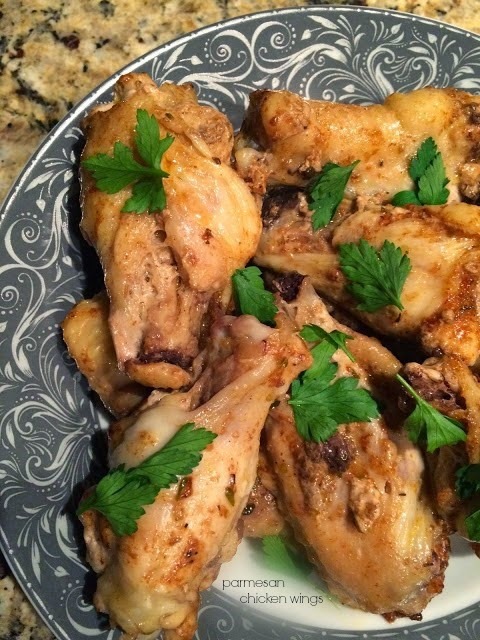 Dip each wing first in the butter, then roll it around in the cheese and spice mixture, coating evenly. Place the coated wing into the pan, leaving space around it. If any butter or cheese remain at the end, pour or sprinkle it over the wings in the prepared pan. Bake for one hour, flipping the wings over halfway through. If desired, sprinkle with chopped fresh parsley to serve. Simple ingredients, outstanding result. These wings look lipsmackingly delicious. Grin....agree...there were a gazillion recipes for wings preceeding game week. But none were as easy as these, Grace. Love the cheese and they look nice and crunchy too. Saved the recipe already. My husband is a big wing fan... these look and sound tasty! heehee, somewhat okay bowl indeed.... I am a super duper lover of all things wingy, these look excellent. Easy and good wings! I like all that Parmesan! And they'd be great any time. I LOVE wings, but honestly never make them because a.) husband doesn't like spicy b.) I don't like the hassle of them. Your wings will make us both happy! But, maybe not for Valentine's! Wings for Valentines Day are...okay I think? So long as they're good wings haha :) Yours sound really good! Wings are good any time in my book, Grace and yours look delicious!!! Sounds terrific! Nothing wrong with wings for Valentine's Day. I'd eat these any day of the year. Yum! All this cheese heaven plus chicken!!! I'd eat these on Valentine's Day!